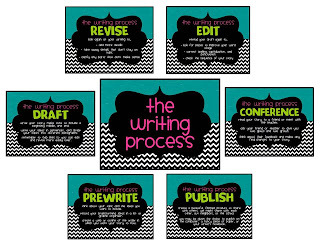 After seeing many cute and creative ways to help hold students accountable when moving through the writing process, I thought I would create some posters that fit the way I teach writing and that would match my classroom... of course! 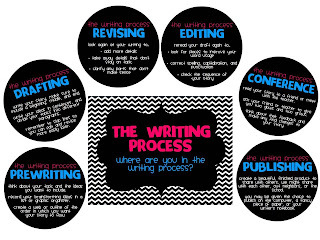 You can see two different sets of posters that match the writing process in my Teacher's Notebook store or my Teachers Pay Teachers store. Let me know what you think of them! I still haven't decide which set to use in my own classroom... decisions, decisions. Your quick post was totally worth it! Girl those are adorable! So creative I love it!! When I take some time to put up a post tonight I will give you a shoutout! Love this! Thanks! I hope they are helpful to some people! I am so enjoying reading your blog!